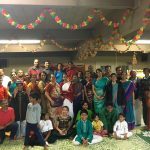 By the benign grace of Sri Swamiji and Lord Sri Hari, the Madhura Utsav from March 30th to April 1st 2012, at Milwaukee was celebrated with much awe and reverence. 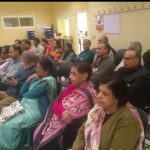 The program commenced with inspiring lectures by Poojya Sri Poornimaji on Bhagavatha Dharma at the Hindu Temple of Wisconsin for three consecutive nights. It was wonderful to see several participants from diverse cultures take interest in her lectures and chant the Mahamantra with earnestness. The Q&A session was fun and interactive and at the same time spiritually educational. The Kids Talent program, presided by Sri Poornimaji was a serenely blissful occasion where all children from toddlers to teenagers expressed their divinity within with much grace and poise through dance, skit, kirtan and reciting shlokas. The Akhanda Namasankirtan on Rama Navami day was also performed joyously by many of our Midwest Satsang families. The most interesting of all events, turned out to be the Madhura Gitam and Madhura Katha game led by Sri Poornimaji. All participants had a chance to articulate their familiarity on different characters from Ramayana, Mahabharata and Srimad Bhagavatam that was stirring and amusing to all. 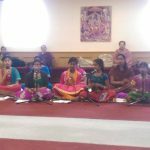 Overall, the Madhura Utsav at Milwaukee happened in a remarkably beautiful manner by the sheer grace of the lord.